Statement: “El Cajon is the poorest city in the county,” said former state Sen. Wadie Deddeh in a June 9 Voice of San Diego op-ed. Analysis: El Cajon has long been home to many of San Diego County’s poorer residents, but the city is now in the middle of a heated conversation about its future. Former state lawmaker Wadie Deddeh supports local government reforms being pushed by Neighborhood Market Association head Mark Arabo, including term limits for City Council members and median income caps for city officials. If true, that means changes in El Cajon’s city government have the potential to affect the poorest population in San Diego County — a county with close to 9,000 experiencing homelessness. Deddeh said he didn’t source his claim from a specific figure, but it’s true that El Cajon has the highest rate of poverty in San Diego County, at least in terms of the federal poverty line — about a fourth of El Cajon’s residents earn an income that falls below poverty level, or $11,770 per year for one person. But the city of San Diego’s poverty rate has risen in recent years to 15.6 percent, and with a population 13 times that of El Cajon, that’s still a massive number of people struggling to make ends meet. Poverty is difficult to define because of the number of variables that contribute to it. One marker isn’t enough to classify El Cajon’s residents as the poorest throughout San Diego County. 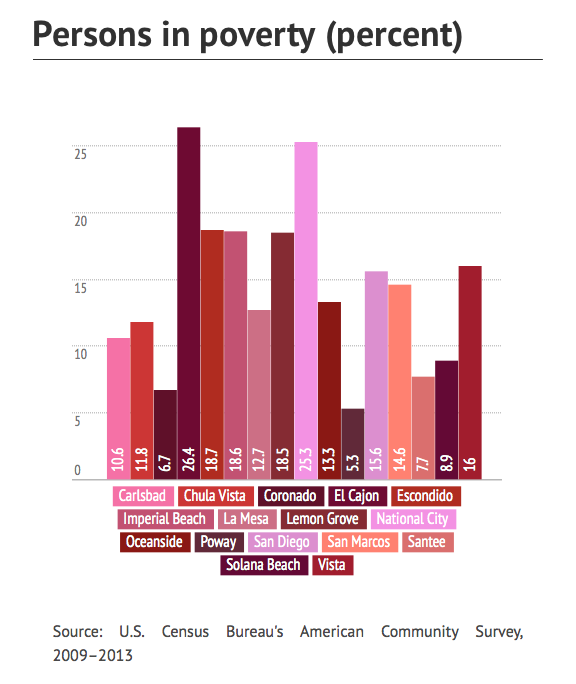 El Cajon is not the poorest in the region by another standard: median household income. 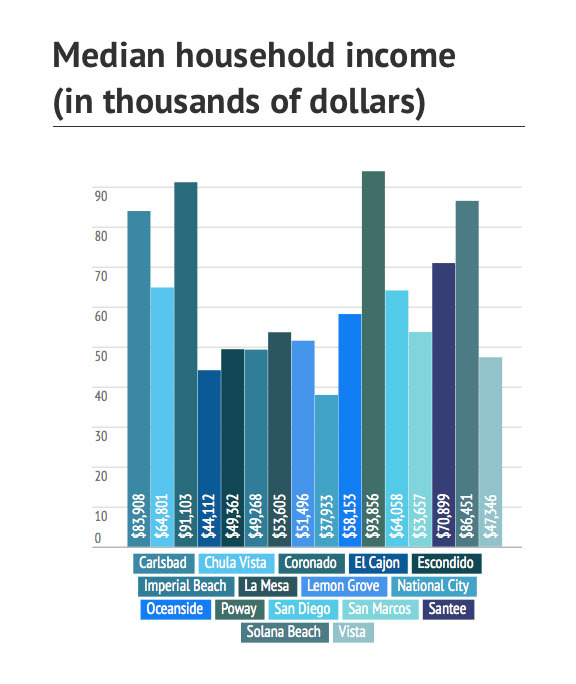 The city’s median income is considerably higher than National City’s and hovers around the same level as incomes in Imperial Beach and Lemon Grove. El Cajon City Manager Doug Williford said the reason El Cajon ranks better in household income than poverty rate is that while there are a lot of poor and homeless people in the city, average income is affected by income diversity. “El Cajon is actually a real mix of just about everything — very upscale neighborhoods, upper-middle-class neighborhoods, middle class, then lower-income, which is focused in our older valley floor,” he said. But that doesn’t change the fact that El Cajon still ranks close to the bottom in the region. Marney Cox, chief economist for the San Diego Association of Governments, said two factors explain El Cajon’s and similar cities’ status: jobs and the price of housing. There aren’t many high-salary jobs in the city, he said, and El Cajon’s abundant apartments and rentals drive down the cost of housing there. That tends to attract San Diegans who can’t afford to live elsewhere in the region. “You’ll find that El Cajon at one point in time, the ’60s and ’70s, was doing fairly well,” Cox said. Williford said the downward trend was foreshadowed in the ’50s, when the city cleared the way for several large, cheap apartment buildings to be built in El Cajon’s central valley. Those developments weren’t brought to a halt until the ’80s. El Cajon has the second-highest unemployment rate in San Diego County at 6.9 percent, behind Imperial Beach. Countywide, unemployment is 4.8 percent. Williford said El Cajon might reduce its unemployment soon, though, with three new car dealerships and plans for a new hotel, a 25-acre hospital campus and the reopening of the East County Performing Arts Center. So yes, El Cajon has a high population of low-income, unemployed and homeless residents and San Diego County’s highest poverty rate. That makes Deddeh’s statement mostly true. But poverty is affected by a host of factors, including income, employment, job quality and quality of life. El Cajon isn’t the worst-off city in the region when it comes to median household income or employment.